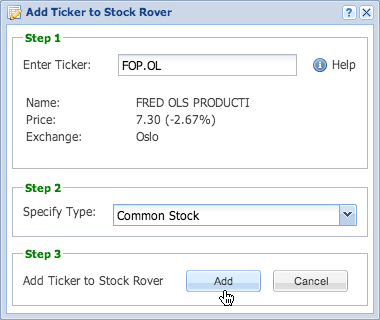 If you want to find a ticker that is not currently supported by Stock Rover, you can dynamically add it to our database. First, type it into the Quotes search box on the left and hit Enter. Note that hitting the spacebar functions the same as the Enter key in this context. 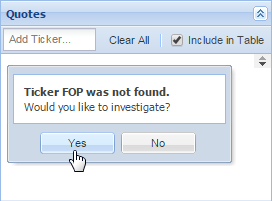 When prompted if you’d like to investigate a ticker, click yes. If Stock Rover finds the ticker, you will be asked to select its equity type, and then you may add it to the Stock Rover database. If Stock Rover finds information on the ticker, you may permanently add it to the database. Stock Rover tries to price every ticker, though more detailed information may not be available.